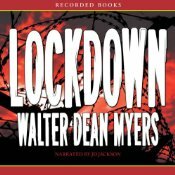 Lockdown by Walter Dean Myers, read by J.D. Jackson. Grades 8+ Recorded Books, HarperCollins, 2010. 5 hours, 3 minutes (256 pages). Reviewed from purchased audiobook. When Reese stole the prescription pad from the doctor's office and sold it so that he'd have money for food, he knew it was wrong but he didn't see any other way of surviving. With his mom getting high and a younger sister to support, Reese needed the money. But now Reese is in a juvenile detention center called Progress, trying to serve his time without getting into more trouble. All he can think about is freedom... but will he be ready to make the right choices once he gets outside? Lockdown gives teens a look inside the juvenile justice system and this book is sure to garner many fans, as Walter Dean Myers's other books have done. Reese is a likeable character. Sure, he made a mistake, a bad decision, but he cares about his family and he's determined to clean up his act. Being good isn't all that easy, though, especially in a place like Progress where gangs offer protection... for a price. Reese isn't in a gang, so sometimes he needs to use his fists to defend himself and his friends, but then he ends up in solitary - a place where days last for months. One joy of the book was Reese's younger sister Icy, an exuberant little girl with big dreams. Reese's love for his sister and his belief in her is one thing that helps him try to stay on the right path. Walter Dean Myers does a nice job of presenting details of prison life that realistically show what it's like. I enjoyed the audiorecording as well. JD Jackson reads with a clear voice, although it occasionally feels a little stilted for a 14-year-old boy. One of the characters, a man in a nursing home where Reese goes to work, is a Dutch man from Fiji and I didn't care for the accent Jackson chose, BUT I don't have enough knowledge to know whether it was an accurate accent or not. Overall, the recording was fine, but nothing I'd write home about. Lockdown is on shelves now. I have 3.5 hours to go until I cross my finish line at 7pm and I'm delving into Sarah Miller's The Lost Crown. I probably won't finish it today, but I'm hoping to get at least halfway through! See you at the finish line! Hey, I'm an Audible affiliate, so if you purchase stuff after clicking on the links here, I may get a commission.